We have a lot of updates to share with you: from improving locales to adding new validations - there is something for everyone to enjoy. "To err is human, but to really foul things up requires a computer" quipped Billy Vaughan. Luckily, computers can also reverse the damage, when nicely asked. To see for yourself, click on the "Compare versions" button in the sidebar of the Contentful editor. You will see the published versions of the entry starting from October 12, 2016, the day we released entry versioning. The feature allows you to be selective in your rollbacks - restore the whole entry, a single field or a mix fields. And we added two dedicated CMA endpoints making it easy to do restores via the API. Head over to the Versioning FAQ to find out the details. Contentful is used by a lot of companies with international ambitions - from specialized retailers and media outlets to airlines and drug manufacturers - providing us with an extensive list of localization requirements and real-life scenarios. To support some of these scenarios, from now you can designate custom fallback locales. That is, when your entry is missing a translation in a specific language, you can specify a different language to be used instead. 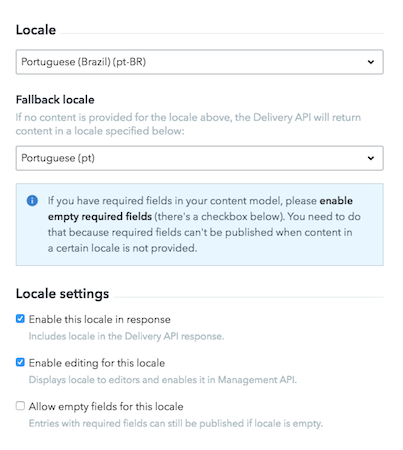 Our revamped localization guide explains the process and highlights some other well-kept secrets about producing content in multiple languages. Don't forget to add it to your bookmarks! Many a developer considers Rails and Contentful to be a match made in heaven. We share this view and want to encourage more Ruby aficionados to tie the knot. Hence, the addition of two new step-by-step guides. The Getting Started guide explains how to setup your project and deploy it to Heroku, while the Using Contentful guide focuses on ways of integrating our API into a Ruby on Rails app. The guides contain many useful Rails references taking a lot of guesswork out of building modern, scalable apps. And once you are done building, let us know. We love to promote projects built on top of Contentful. Generic titles (and URL slugs they spawn) create two fundamental problems for online publishers: they bore the audience and make internal databases go loco. No wonder that admins in charge of those databases kept asking us for a solution to this decade-long problem. And we have obliged. The newly-added uniqueness rule checks for all the published entries of the same content type to ensure the selected field contains a unique value. If the check passes, an entry is published; if it fails, an error message points the user to already existing entries. The only thing your databases need to fear now is race conditions. "Web apps are like children," noted a designer on our product team, "there is always room for making them prettier and better-behaved." The changelog entries seem to support his point. In the last three months, we have revamped the web app navigation, polished the markdown editor, and taught the web app some proper UX manners. Also, when publishing an entry referencing other unpublished entries/assets, you will be informed about the fact. And talking about assets, check out our illustrated guide to working with media. It covers many popular questions we get and has some nifty productivity tips. The ?w=750&h=1334 parameter alone will save you a couple of hours per month.